Whatever the cause, such as sports injury, arthritis, osteoporosis, postoperative healing or simply just old age catching up with you, hip pain can be a real downer on your life and it can make even the most mundane of everyday tasks seem like a real effort. Worse still, if you don’t get something to help out by giving you extra stability and support, things can actually start to get worse, to the point where you need a hip replacement. Hopefully, though, things won’t get that bad if you invest in a good hip support. A good support will help take the weight and strain of your hip and also hold it in place so that there is a much reduced risk of further injury or strain, and they can help with common hip problems like hip abduction or hip displacement. You can find a huge variety of models on the market, from heavy duty braces specifically for post op, as well as sport ones they are built to withstand the motion and sweat from intense physical activity. At Apex Health and Care, we only list the very best products in terms of construction, design and effectiveness, and everything has been tested for health and safety and to meet industry standards, so no matter what you are after, we’re sure that you’ll find it here. 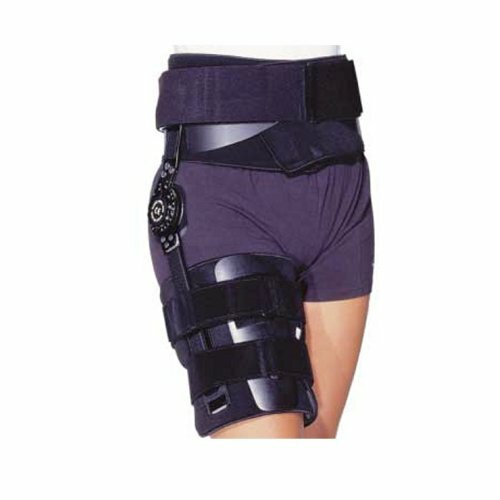 Sports Brace – These hip braces are specifically designed to help you on the sporting field in in the gym. They are usually quite lightweight, so they can slip on under or over your clothes with ease, and they won’t weight you down to much. They also usually allow for a full range of motion, while supporting and stabilizing the hip and groin where it is needed the most. As sport can make your body generate a lot of sweat and heat, these are designed with breathable fabrics and usually some kind of moisture wicking or ventilation to help let the sweat evaporate. These will not help with serious injuries like dislocations – a trip to the hospital might be in order for that. Post Op Brace- These can often look like something robot or something from a sci fi film and these heavy duty braces are designed to help after an operation or surgery around the hip area has left the patient severely weakened. They may also be used in cases of hip abduction or hip dislocation. These are quite bulky and must be worn over the clothes. They give as much stability as possible, but might be a bit awkward to wear and leave motion a bit restricted. Still, if you are in this situation, you really need all the help you can get. It is worth noting that these can be very expensive, as hey are serious medical equipment, and you should buy one unless you really need it. Support Brace – These are the simplest type of hip supports on the market, and they are not designed for heavy duty tasks or for sports. They are mainly indented for those who, for some reason or another, have a little bit of hip pain or perhaps arthritis, and they just need that extra bit of stability and support to go about their daily lives. They are lightweight and usually very discreet, as they go under your clothes and no one will every know that you are even wearing one. They are usually very similar to sports braces, but they are not designed to cope with the movement and sweat that intense and strenuous activities can generate. Pregnancy support – As all mothers know, pregnancy puts a huge strain on your hips from the added weight of the child. Therefore, there are a number of wonderful maternity belts on the market that are designed to help wit the extra load of your precious little one. some of these are hip belts which can be worn be non-pregnant women as well, with others are specifically designed to be worn with the baby bump. The Philippon Post-Op Hip Brace was developed in collaboration between medical product manufacturer Beldsoe and Dr. Marc Philippon, MD, Director of Sports Medicine/Hip Disorders at the University of Pittsburgh. 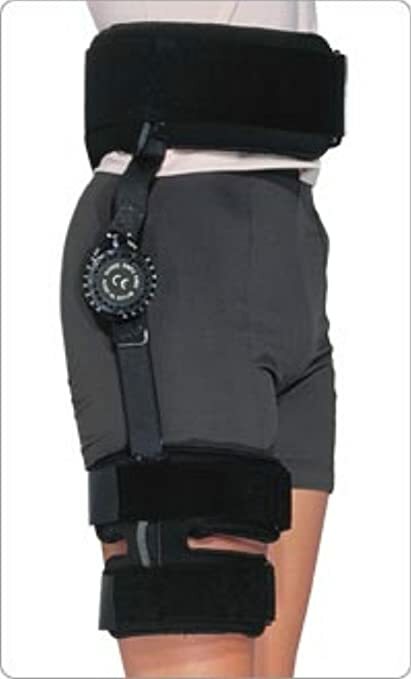 This heavy duty brace is perfect for post surgery recovery, as it limits hip flexion and extension as well as hip abduction, keeping all the joints and muscles in their proper place and cutting down on the likelihood of extra strain, so the healing process can occur. It can also be locked into specific positions depending on the surgeons instruction. Patients following total hip revisions, arthroscopic hip repairs or other hip joint surgeries, injuries or problems will benefit greatly from this brace. Despite looking so big and cumbersome, most people will be able to get it on in around 3 minutes, and it offers the utmost protection with its aluminum shells covered with a double-thick ultra-breathable polyurethane foam padding with a comfortable loop pile surface. Adjustable straps hold everything in place, and allow the patient to get the tightness, compression and stability that they need. What we really love about this one is that it comes in 12 varieties, covering all different sizes for left and right hips. It even comes in Kids sizes too, so no matter who needs the brace, they can probably find the size to suit them with this brand. For starters, we just love the name of the company that make this, Orthokong, and as you can see from the picture, this brace really is just like King Kong in terms of power and protection. This is designed to help adult patients who have suffered from a number of different hip problems such as hip dislocation soft tissue damage, hip adduction, and many mre, and will also be great for those recording from a hip replacement or other surgery in that area. 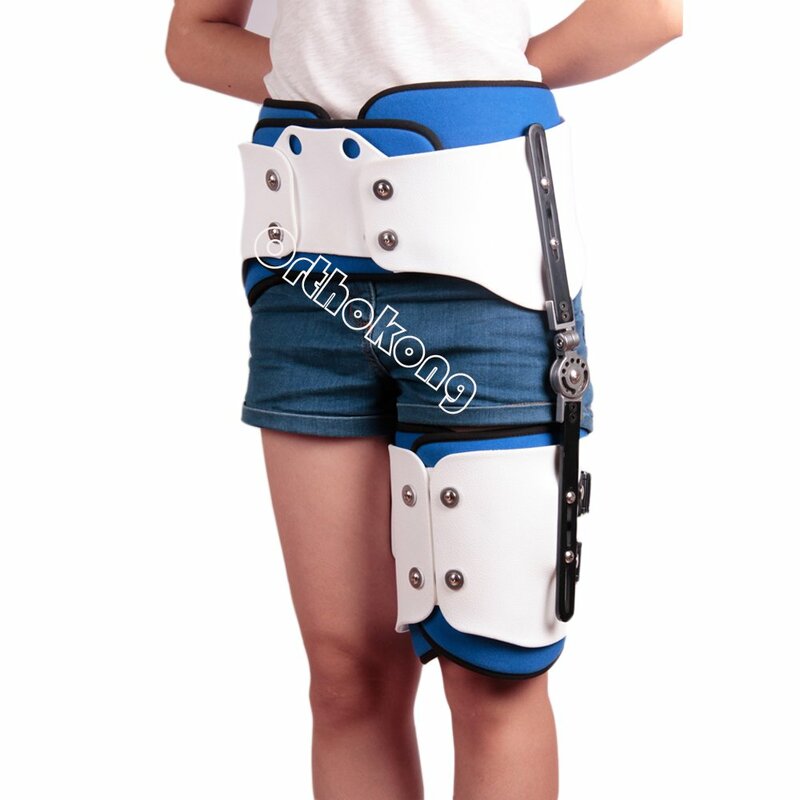 Despite looking like something very complex and difficult to use, this is surprisingly easy to get into, and its straps, hinges and connections are easily adjustable, so that the patient or doctor can get the perfect fit to aid in the healing process. This gives stability, support and protection, and before you know it you will be walking around and feeling great about your healing hip. This is also one of the few post op braces that we have seen which can be used on either the left or right side, which is an impressive and very unique design. Please be aware that shipping of this brace can take 8 to 10 days, so if you have a surgery scheduled and you know you are going to need it, please take that into account and order it so you will have it in time. This supporthas been made from breathable neoprene compounds and is designed to keep you cool and comfortable in all circumstances, which is good news considering the part of the body this is wrapping around. It can be worn on either leg, and both men and women will feel comfortable and supported while wearing it, and it has latching straps to let you easily fit it around your unique body with strong velcro to hold everything in place. It can give you really good injury support for hip, sciatica, hamstring injury, and the increased blood flow from the compression helps with healing and edema as well as giving you some pain relief. We really like this one as it is thin and quite discreet, so if you don’t want the whole world to know that you’ve damaged your hip you can slip it on under your work or gym clothes and no one will every know. 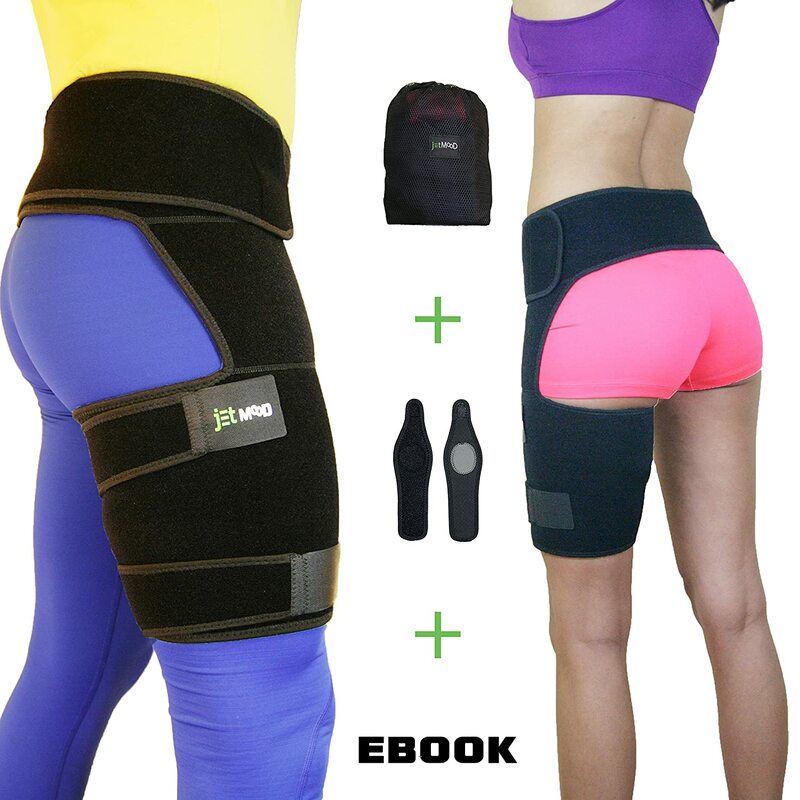 Help say goodbye to your hip and groin woes with this great brace from Jet Mood. This will significantly speeds up recovery from groin pull, groin strain, hamstring pull, hip bursitis, hip flexor injury, labral tear, SI joint and sciatic nerve pain or other injuries that can affect the groin, hips or thighs. The compression wrap improves overall stability during movement in your daily activities or sports, so you are much less likely to re-injure yourself and you can get back on the sports field free of fear. Increased blood flow to the damaged area will also speed up recovery time and give a bit of respite from the pain. Whether you have a hamstring injury or hip injury or suffer from sciatica nerve pain, or arthritis is making your groin and hips a problem area, this support will have you covered. This will quickly bring you soothing compression within minutes of slipping it on the injured area, while the groin wrap reduces pain and gives extra stability as you walk. Made of therapeutic breathable neoprene, this will keep your muscles warm and secure as you heal. 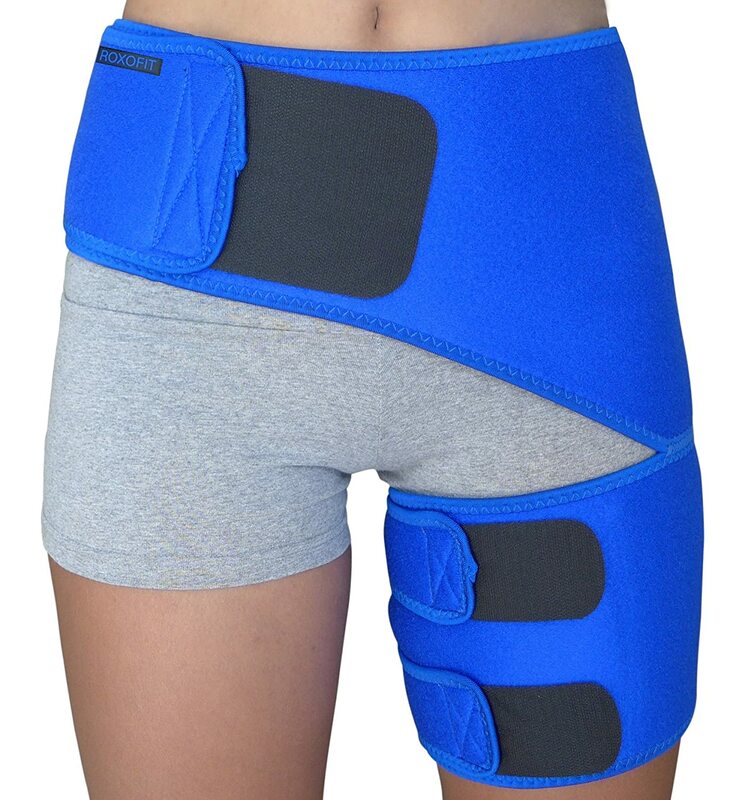 This fits perfectly on waist sizes up to 45” and thighs up to 25” in circumference at widest point, and if you’ve recently suffered a groin injury, hip pain or hamstring tear, this will easily fit on under your clothes to help you get back to fighting form. 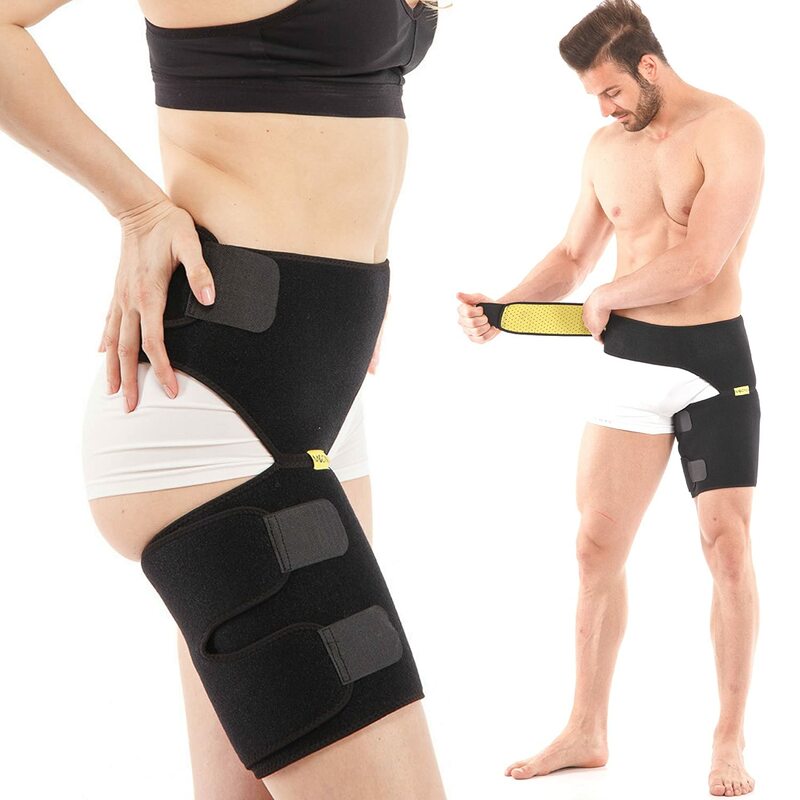 If you’ve been on the bench with a pulled groin or swollen hip, this Zenkeyz hip support and groin wrap will get you back out there with its compression strap and maximum support for strains, pulled muscle, hip joint pain, hip tendonitis, sciatic nerve pain relief, sciatica! Unlike other groin supports, the Zenkeyz’s groin injury support comes with much larger straps than many others’ giving you a wider range of contact and more compression and support for the affected area. Its one size should fit most if not all, and this unisex item can be used by all genders. Best of all, this comes with a whole host of free bonus items including 3 kinesiology tape strips for your everyday muscle pulls, 1 carry bag and 1 E-book with useful advice on how to wear the brace. That makes this a really good value for money purchase, and those looking for a good deal or people on tight budgets should check this out. Looking to ice off a swollen hip or heat up a sore, stiff one? The we have the perfect brace for you with this innovative design from NatraCure. 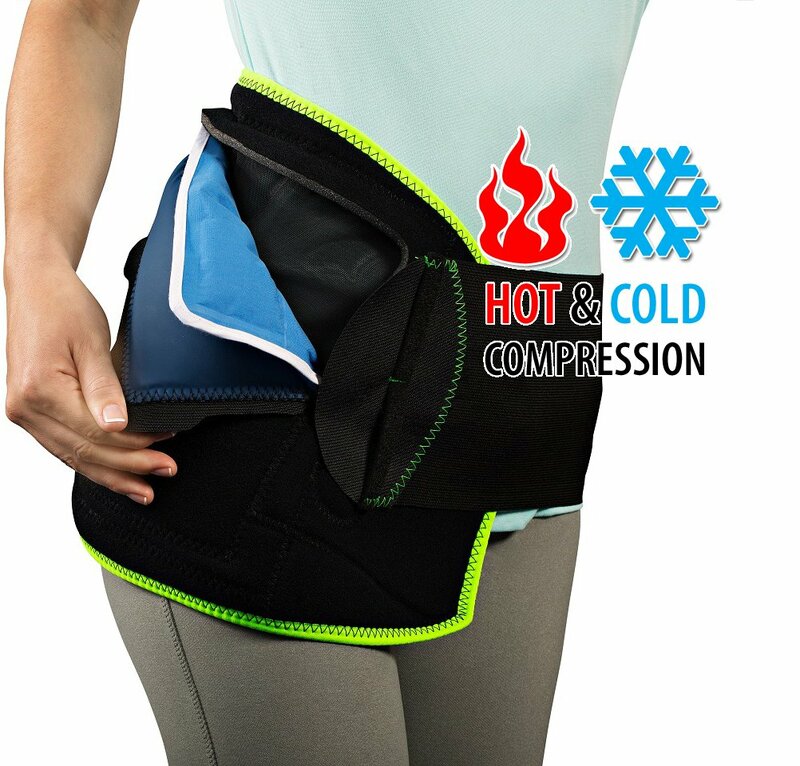 Designed by renowned orthopedist to ease pain from Arthritis and Post-surgery, this support has built in pockets for either its microwaveable heat back or its ice packs, and the broad stretch band applies compression to the hip area, which can help with pain relief, reducing swelling and edema. This can either loosen up stiff hips or help with the swelling and pain from surgery or injury, and this will be very good for those who suffer from arthitis who want a little bit of a respite from their sore hips. 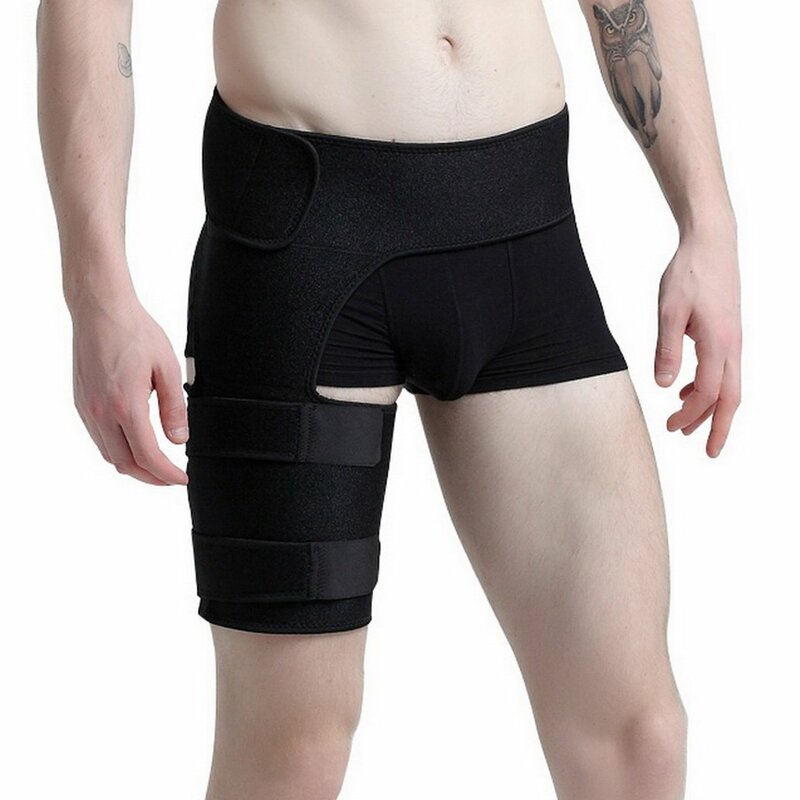 This discreet and very lightweight hip support is brilliant for those with mild pain and instability who want something that will be comfortable under their normal clothes and give them the extra support they need without drawing attention to them. Made of a blend of 70% Neoprene, 20% Nylon, 10% Polyester, this is light and breathable, and it also has a mesh design to let the moisture evaporate, so you don’t have to worry about this making you damp and uncomfortable below. This has a strong Velcro strap which both holds the brace in place to prevent it from slipping and can also be used to adjust the tightness, giving you the level of compression that you want. It is is a good choice for those who want something low key to help with minor hip instability, and it can help alleviate pain and warm up stiff arthritic hips as well. This may also help with hip flexor injures or bursitis recovery. 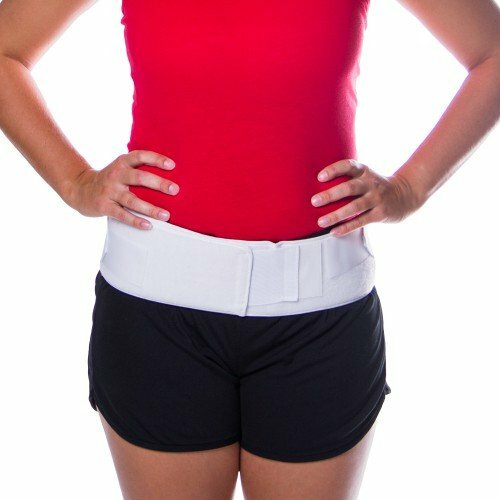 Get some light support for your hip with this lightweight and very breathable hip belt. This is made from breathable fabric and it has a sleek, non-bulky design that means it can easily be concealed under your clothes if you don’t want to draw attention to yourself or ruin your color coordination. Its patented and unique tapered design gives even pressure distribution all round the waist and giving the right amount of support to the SI joint, so it can be worn for long periods if time if necessary. This can also be adjusted with its dual hook design and anti-slip buckle, so you can make it fit your body just right and stay in place. This offers relief from pain and support for a number of hip issues as well as lower back pain, back spasms, pelvis pain or sciatic pain extending down the leg. It is available in 2 sizes, S/m and M/l, and S/M should fit a pelvic circumference of 30-46″. 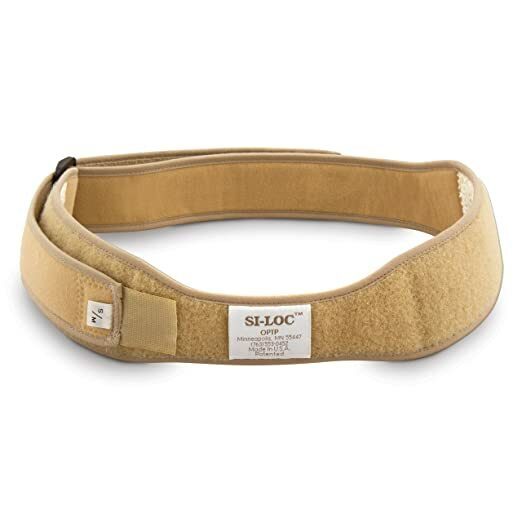 Sometimes its the little things that can make a world of difference, and this discreet hip support belt is just when it comes to helping with hip and low-back pain. It brings pressure and support to the hip, pelvis and lumber areas while stabilizing the joints in of the lower back. By giving maximum support to the trochanter region of the body, this can help address the cause of sacroiliac (SI) joint pain or lumbosacral instability, and it will be very good for women with these conditions. The flannel lining is warm and soft in addition to being durable. and its elastic side pulls makes sure that it is a snug and comfortable fits against one’s body. It is light and thin enough to discreetly sit under your clothes, and you can use its adjustable straps to make it sit perfectly against your unique body. 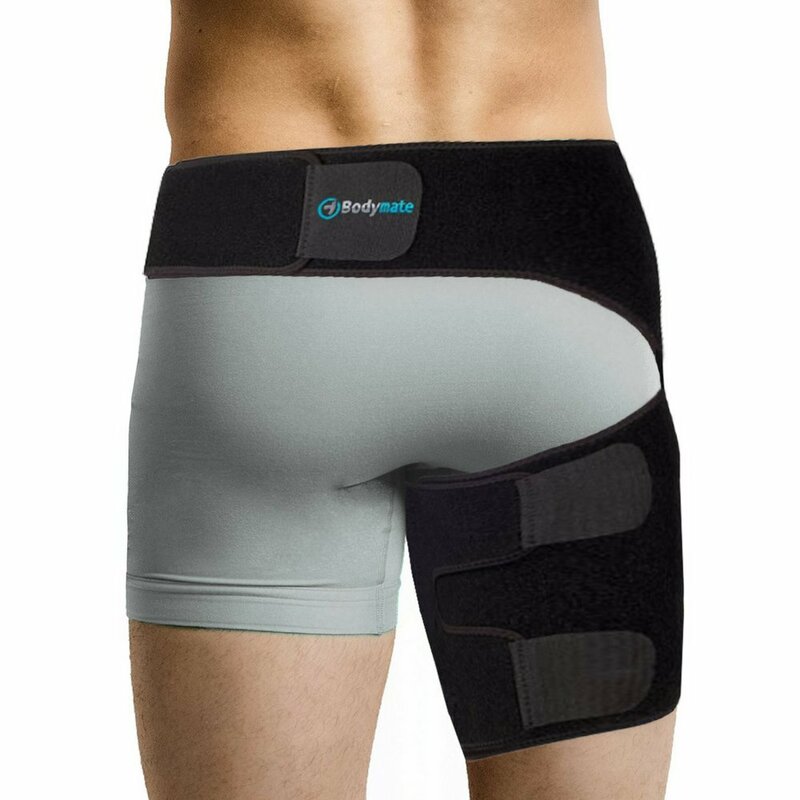 If you have a hip circumferences of up to 48 inches, this will definitely fit you, and for women suffering from hip pain, facet syndrome or SI joint pain (AKA, sacroiliitis), this is a really great support. You might not believe it just y looking at it, but this slick little band can work wonders with a number of symptoms, including hip pain, and can make walking feel natural and comfortable again. By reducing the pressure on the knee and giving more support to the thighs, this can help with sore, tires or stiff hips as well as the stinging pain and swelling caused by ITBS. 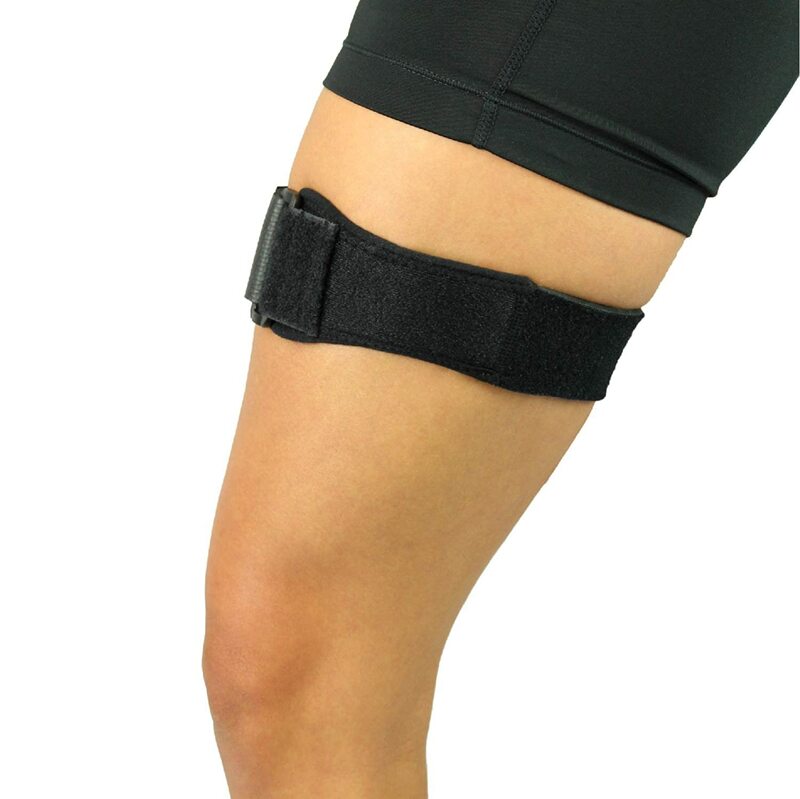 The band strap supports and stabilizes the iliotibial bands. It also has an integrated gel compression pad which can dampen the vibrations caused by walking and running, which also cuts down on pain and helps provide greater stability and protection. Best of all, it is a breathable, moisture-wicking neoprene wrap that won’t leave you damp and sweaty down below. Obviously, this is a unisex product, and those looking for a lightweight support for knee, thigh and hip pain should check it out. The hips are such an active and dynamic part of the body that there are a number of injuries or conditions that can cause pain in this area. If you’ve got pain and you’re not sure what it is, chances are that it could be one of these. Also, if you suffer from any of these, one of our wonderful hip braces will definitely help you out, whether you need pain relief, extra support, or just want to get back to the gym as soon as you can. This occurs when the hip adductors, muscles that pull the legs together, get strained, damaged and torn. The muscles hold the thighbones and the hip together, stabilizing the joint. Whether it be from too much strain, sudden changes of direction, hyperextension or not warming up enough, tears in the muscles can bring hip pain, swelling, and aches. Very bad tears can give tremendous sharp pain and leave bruises all down the leg. Usually, rest ice and elevation will help a pulled groin get back to normal, but in severe cases, a trip to the doctor might be in order. You might not realize it, but a tear in your Hamstrings can also be a cause of hip pain and loss of mobility in that area. While a tear lower down usually gives problems in the knees and lower leg, a high up tear of the hamstring can result in a lot of hip pain, too. 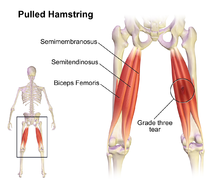 Hamstring problems can usually be treated with the good old RICE approach, but sometimes are severe enough re require surgery. 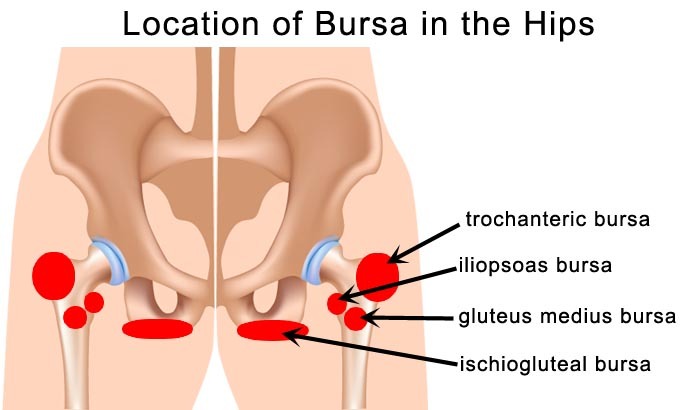 Bursitis are sacs of fluid that we find in all our joints. They help make movement fluid and friction free by lubricating the movement of the bones and muscles in the joint areas. 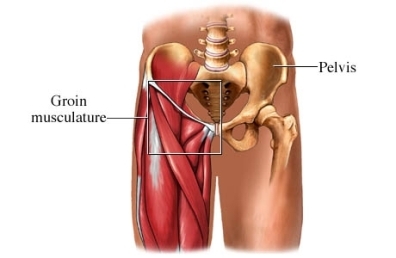 Sometimes, due to a number of causes, this sac can become inflammed, making moving the hip, leg, and anything else attached to it very painful. Again, rest, ice and a good hip brace will usually set hip Bursitis right again. Anit inflammatory medicines can also help with pain relief and speed up recovery. The Labrum of the hip is a cartilage ring that holds the femur bones in place. From injury or simply over time from natural movement, on some people the labrum can become frayed and torn, which is a huge factor in the onset of arthritis in the hip. Unfortunately, the symptoms usually only arise long after the damage to the Labrum has been done. Therefore, a quick and early diagnosis and speedy start of treatment is the best rememdy here, so if you are experiencing hip or groin pain that doesn’t seem to go away, get a good doctor to runs some tests right away.